Welcome to my little corner of the Internet. I hope you are having a fun time checking all the different blogs that are participating in Quilters Meet and Greet. 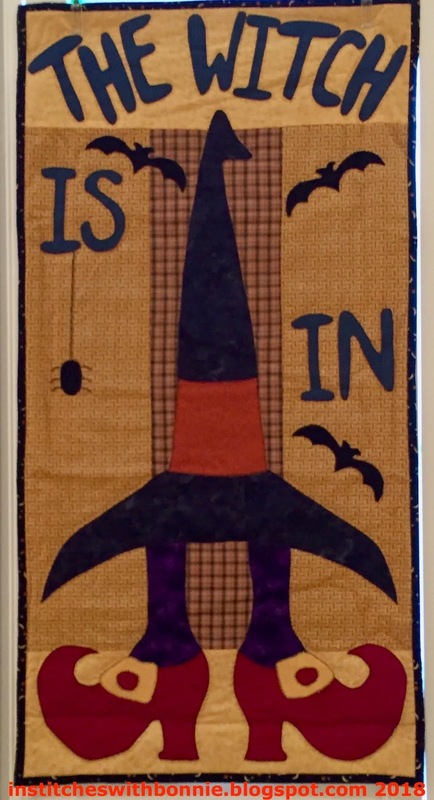 With October just around the corner, I've decided to share some Halloween quilts that I really like and hang up every Halloween. First up is a round robin done by a group of gals who were all active on Prodigy in 1999. We did this as a row robin. Each of us sent a row that would give the general theme to the rest of the members. Mine was Halloween. The top row of pumpkins was mine. If I remember correctly the rows were not attached so folks just made a row to add wherever the owner wanted once everything was returned. It was a lot of fun to finish this quilt up. I was so impressed with the Sunbonnet Sue row. The little "candy corn" at the door also had a paper bag in her hand. I always get so many nice comments when I share this quilt. And, because I was really on top of it when I sent my row out, I also have a really cool label for it. I just love that tree. I am guessing (cause heaven knows I don't remember) that I traced it from a book of art for quilter's labels. Everyone signed and said what part they produced. With one gal from Spain it was an international group. I can't remember if there was a Canadian or not. Hey, if you remember this round robin or see your name please send me a note. The next two are very small, projects doable in a day. The first one is Grim Ripper. (No, not reaper, ripper....) I was able to find the location of the free pattern if you want to make one for yourself. It is 10" x 13" and would fit beautifully on the iron stand shown in this post. I bought it from Connecting Threads. Now I just need to add some loops and remember to put it out come October. And my last little Halloween quilt is one that was either given to me in a swap or I bought at a silent auction. It is a darling little pumpkin -- one that can stay out for all of the fall months. It is tiny -- 8" x 10" It's made up entirely of 1" finished (1.5" unfinished) squares and half triangle squares. The background is various black fabrics. And the stem is one green square and one half green half black triangle. Hope that gives you all the info you need in case you want to make your own scrap pumpkin. Click on the picture above to find a list of the bloggers who are participating in the Meet and Greet. Then take some time to visit a few of them. I hope you spend some time visiting the links listed above. Fun quilts! The Row Robin is adorable: the little trick or treaters definitely steal the show. 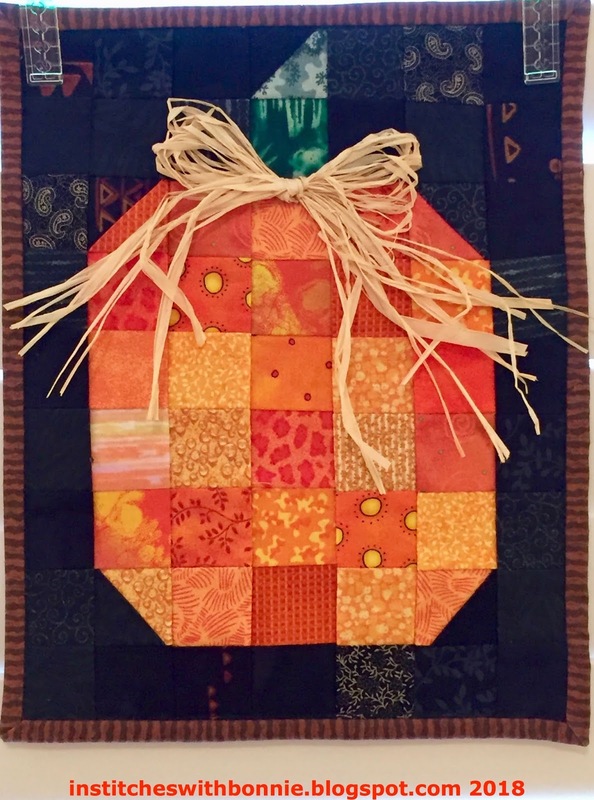 Very fun Halloween/fall quilts. The row quilt is adorable, I don't think I've ever seen that one on the blog before. Nice to join you in the M&G. (I counted, and there are 80 of us.) Your Halloween round up is fun -- the Grim Ripper is great! Grim Ripper! Now that was clever. I love puns! 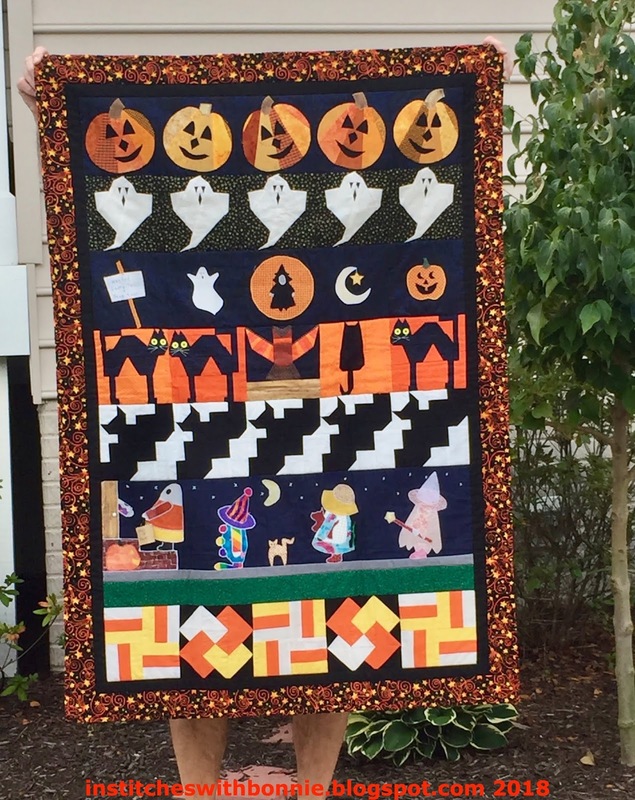 Your Halloween quilts are great! The first thing that caught my eye was your blog header picture! Love how the purple and green in the quilt brings out the purples and greens in the yard. That's a great shot! Now, you've got me wanting to make a Halloween quilt!!! Sigh... maybe NEXT year. Too many projects on the go right now! Fun!!!! Halloween posts!!!! My favorite! Great Halloween quilts, Bonnie...and I too love your header picture - such a perfect quilt for that perfect setting!! Nice to meet you on the Quilter's Meet and Greet! What fun Halloween quilts!! Halloween is such a neat holiday and a great one to decorate for. Looks like you've done that up in fine style. Loved seeing the label; I'm a stickler for making labels! Cute quilts! Love the little trick or treaters in the row quilt and Jack the ripper is a close "friend" of mine. 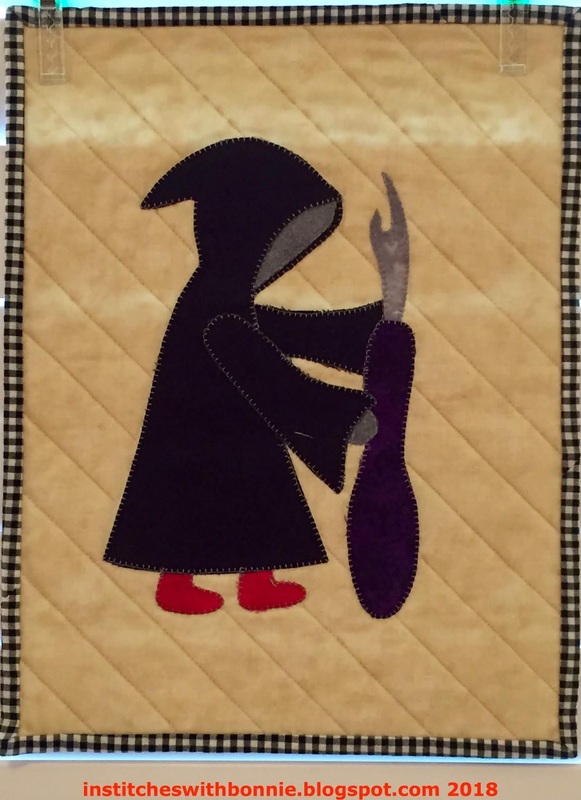 I love your Halloween quilt show! Like everyone else, your header was a delight to see. Love your Row quilt and the label was sheer genius!! I did a row quilt with a group of ladies and when I quilted it, I quilted their name on their row...but I like your label so much better!!! Just love your Halloween pumpkin! Going to try it! 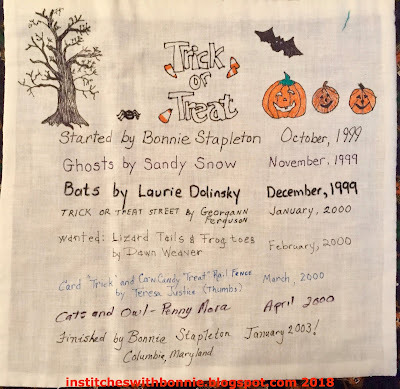 Your Halloween quilts are adorable! I usually read your Blog every Monday and enjoy seeing what you're working on. Thanks for sharing. Bonnie, I enjoyed the Halloween/fall quilt show. I thoroughly enjoyed the Grim Ripper. I think every quilter/seamstress needs one of those. That would make a great gift for a quilter who doesn't have one. I have a friend who loves orange. I must make her a pumpkin. It shouldn't take long except that I don't have orange fabric. Of course, If I could find a fat quarter bundle of oranges, that would fit the bill. I saw that you have grandchildren. Mine are just the reverse. I have three grandsons and one granddaughter. I have two grandsons that are twelve. I love when people ask if they are twins. One belongs to my son and one to my daughter. LOL I should say "Yes, they are identical." And then give the explanation. One day, my group of widow friends were talking and someone said something about a boy/girl set of twins and someone asks if they were identical. Geez! I saw you have hints of spiffing up my studio. My therapist told me to set a timer for 15 minutes. It's my entire house that needs help. I'm disabled and have trouble with energy. It has all become overwhelming. I did get a small area in my kitchen decluttered and have kept it that way. Then a family emergency set in and I haven't gotten back to it. It'll happen. It didn't get this way overnight and it won't get back the same way overnight. Thanks for participating in the Meet and Greet and bringing a big smile to my face. 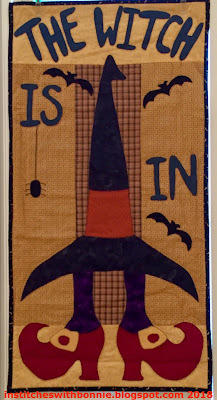 Your a girl after my own heart with this fun Halloween quilts! Love it!!!!! Your row quilt is great fun...and I love that wonderful pumpkin too. Thank you for having us over for a visit! A row robin,that is a great way to add to what has gone before your turn, or in your case, add to your first row. The witch, what a fun design. Nice to meet you Bonnie. Thanks for sharing your Halloween quilts - all very cute. I used to do a lot of seasonal decorating when our children were younger. The most fun was hanging plastic eggs on a tree in our front yard. We would also hang ghosts and pumpkins in the same tree. I still have all of the decorations, but don't take the time to put them up anymore since the kiddos are all grown. Blessings!